Amazingly enough, I just brought home the last Fall CSA box. (Fear not! 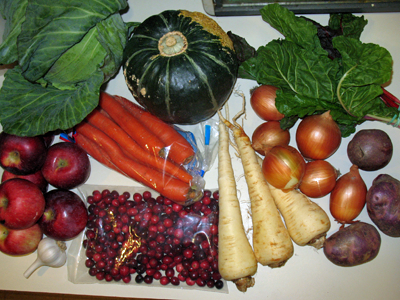 The Winter CSA starts up – improbably – this coming Tuesday, so we’ll be under a deluge of fruit and vegetables by Wednesday.) This last Fall box had an interesting variety of items, most of which I expect to find at the grocery store. The purple potatoes are questionable – that may be more of a specialty item, but the rest are pretty mainstream. I also have to make a confession: we’re giving away the parsnips. I KNOW, I KNOW! BAD MONKEY! But, here’s why: dh isn’t too enthused about them, and I think my stomach woes from the other weekend were related to having too many parsnips with dinner. While I understand that just eating fewer might be the solution to that particular problem, it’s a little harder to accomplish if you’re the only one in the house that will eat them. Thankfully, one of my co-workers admitted her love for ‘snips, so I brought them home to weigh them and then they’ll head back to work to be handed over to a loving home. Looking at the box, I’m somewhat at a loss as to what I’m going to do – we have red and new and sweet potatoes already in the house, so what on earth do we do with the purple potatoes?! I got cranberries. I’m used to those arriving in liquid form, often mixed with grape juice and bearing the “Ocean Spray” label. So, once I have a moment, I need to go digging through my cookbooks and see if I can come up with some inspiration for what to do with this bounty. The apples present a slight conundrum in that I’m just not 100% sure which kind they are. Last time, I thought I had macouns but they may have been empire. Some of these resemble the empires from last week, but others are so deeply purple that I’m not sure WHAT they are. Then again, I refuse to feel badly about this. At a conference this week, I was discussing the varieties of apples grown locally with one of the attendees who’d traveled up to Massachusetts from Florida, and his eyes got wider as I kept naming more and more types of apples. Then again, his idea of “fresh whole fruit” includes oranges year-round, so there’s something to be said for geographic variety. Since we’re gearing up for snow (before Hallowe’en? for reals?! ), it’s unlikely that we’ll want to grill anything this weekend. Still, as long as we have power to handle the thermostat, I can imagine that the buttercup squash may find a temporary home in the oven. And I think I can promise – without a shadow of a doubt – that the cabbage will be used in some fashion OTHER THAN cabbage and corned beef. I can’t describe a dish I feel more ~meh~ about than that one. That doesn’t mean it won’t go into the crock pot; I can just promise it won’t be with corned beef. Also, I’m kind of a less-is-more parsnip girl. I’ll toss a few in with roasted veg, but for the parsnip adverse, you hardly notice 1 or 2 tossed into potato leek soup or mashed potatoes. But – I’m so down with giving up the less-than-loved veg when the counter is overflowing. I do it all summer long with zucchini, eggplant, summer squash. I have a soup/stew recipe that uses cabbage, along with ground beef, carrots, potatoes, and peas, that way you would use some of your potatoes too, if you would like it. It’s for the stove top, but it might be adaptable for the slow cooker if needed.